Posted on Friday, April 30th, 2010 at 9:37 am. In the last 2 months, thousands and thousands of fans across North America have flocked to movie theaters to experience the political drama Formosa Betrayed. Those of us who have been involved in the making and distribution of the film have been humbled by the tremendous outpouring of support and appreciation that we’ve received from fans all over the world. From our website to our Facebook page, to the hundreds of articles and reviews that have been written about the film, it’s obvious that Formosa Betrayed’s story of Taiwan’s struggle for identity, justice, and democracy is something that needed to be seen and heard. On behalf of the creators, we thank all of you for coming out to see Formosa Betrayed and spreading the word so millions of others can be affected by this unique film. Formosa Films and Screen Media Ventures are proud to announce an agreement with IPA Asia Pacific and Sky Digi Entertainment Co for theatrical distribution of Formosa Betrayed in TAIWAN!!!! Since before the film was completed, thousands of fans have been wondering when the film will be released in Taiwan. Now, we are excited to announce that the film is scheduled to be in Taiwanese theaters beginning the weekend of August 6, 2010. Actor/writer/producer Will Tiao, director Adam Kane, and several of the actors from the film have been invited to promote the film in Taiwan prior to its release. Please find attached the official press release in Mandarin Chinese and English that has been released to media outlets in Taiwan, the United States, and worldwide. Any press inquiries regarding the Taiwan release of Formosa Betrayed should be directed in the United States to Michael Dwyer at Screen Media Ventures at (212) 308-1790 and in Taiwan to Tiffany Wang at Sky Digi Entertainment at 886-2-2231-1010. FORMOSA BETRAYED DVD OUT IN NORTH AMERICA ON JULY 13 — PRE-ORDER NOW!!!! Feel free to pre-order your DVD now!!! You will also find Formosa Betrayed DVDs at your local Blockbuster, video stores, and hundreds of other locations where DVD’s are rented and sold. 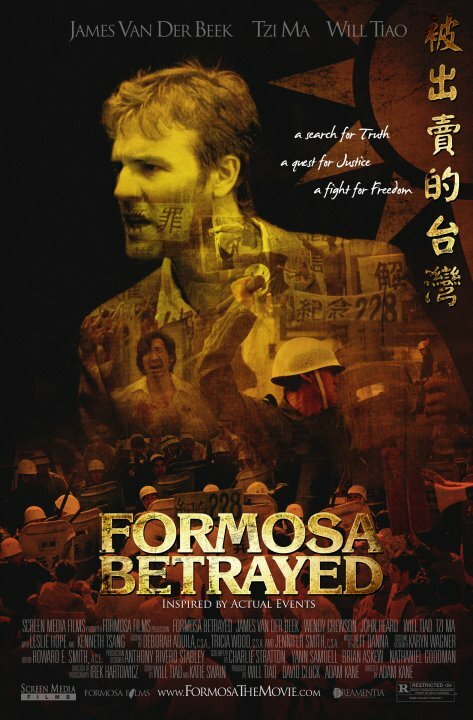 Formosa Betrayed will also be available on video-on-demand outlets such as iTunes on the same date. REQUEST TO SEE FORMOSA BETRAYED IN A THEATER NEAR YOU!!! Since Formosa Betrayed opened on the weekend of February 28, the film has been seen in over 30 cities across North America — from New York to Los Angeles, Washington DC to San Francisco, Toronto to Dallas, and many many more in between. Formosa Betrayed continues to play in Honolulu, Miami, Atlanta, and Seattle. The film is scheduled to open in Minneapolis/St. Paul, Raleigh/Durham North Carolina, and Cleveland, Ohio in the next few weeks. Please check our website www.formosathemovie.com for more details on theaters where it is opening. If you would like Formosa Betrayed to play at at theater near you — and you feel that there are at least 300 others in your city who would like to see it as well — please email us at [email protected] and we will do our best to add your city to the list! As you know, Formosa Betrayed is a small independent film without a large advertising budget — so we truly depend on fan support to get the word out. The critical and commercial success of the film speaks for itself — not only has the film been given numerous film festival awards and received critical acclaim from some of the top film critics in the country — it has consistently been amongst the top films in the country on a per screen average since it’s release. We urge you to continue to tell all of your friends, neighbors, loved ones, and everyone you meet to see the important story of Formosa Betrayed. FEEL FREE TO FORWARD THIS NEWSLETTER TO AS MANY PEOPLE AS POSSIBLE. We thank you again for all your support and hope to see you in the theaters or on your television very soon!